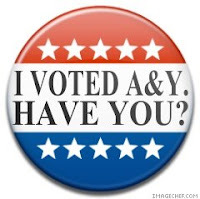 Alive and Young: Vote A&Y in 2008, and I Promise To . . . I Promise if you vote for me over at the Catholic Blog Awards and I win top honor in representing all of catholic blogdom in whichever category I will . . .
Vote for Alive and Young in 2008. Don't vote for the other guy as if he (or she) wins he (or she) will destroy the world, pillage America, beat homeless people with bats, won't recycle, run around naked singing the theme song from Scooby Doo, and eat your babies. That is why you need to vote Alive and Young in 2008. **Chuck has already agreed to this. He has also promised to increase jobs in America by sending ninja teams to sabotage and take them back from other countries. Beat poor people with bats? The SPCA will be ALL OVER that! A bat is a rat is a boy is a cat! "Don't vote for the other guy as if he (or she) wins he (or she) will destroy the world, pillage America, beat homeless people with bats, won't recycle, run around naked singing the theme song from Scooby Doo, and eat your babies. That is why you need to vote Alive and Young in 2008." Man! You're discovered my secret plan! You're good!